So it’s safe to say that Finding Dory has a lot to live up to. Even if we acknowledge that there’s no way Dory could have the same impact to the industry and the art of animation as Nemo did, the fact is that Nemo remains one of Pixar’s most beloved films, and with good reason. Could Finding Dory match the cleverness, humor, beauty, and heart of its predecessor? In a world filled with unnecessary sequels could it justify its existence at all, and prove worthy of the Finding Nemo and Pixar names? The answer to both of these questions is a resounding yes. In addition to being one of the most visually stunning films of all time, Finding Dory is deeper, more thoughtful, more complex, and even funnier than Finding Nemo. 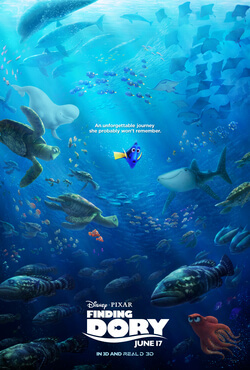 It may lack the streamlined perfection of the first film, but in place of that Finding Dory tells a story of a richness that would have been impossible in the pre-Nemo area. In that way, it’s the ultimate culmination of what Finding Nemo brought about all of those years ago, a story that will touch all those who see it no matter their age, unifying all in laughter and tears. Finding Dory picks up a year after the events of the first film. Dory is living next door to Marlin and Nemo, who, sometimes grudgingly, put up with the side effects of her particular quirk, short-term memory loss. Dory sometimes wakes them up in the middle of the night, forgetting that it’s time for sleep, and Mr. Ray would rather not take her on the class field trips because she’s a bit of a handful, but they still love and care for her. So when something suddenly triggers memories of her parents, the ones about whom she asked “Where are they?” in the first movie, Marlin and Nemo agree to accompany her to find the “Jewel of Morrow Bay, California,” the only clue she managed to gather from her flashback. After hitching a ride with some friends, a scary encounter or two, and some more triggered memories from Dory’s past, the trio ends up outside the Morrow Bay Marine Life Institute, which rescues, rehabilitates, and releases injured marine wildlife, and Dory’s original home. But before they can even come up with a plan to find Dory’s parents, Dory is rescued by Institute workers, taken to the quarantine room, and tagged for shipment to Cleveland, where they send animals who are unable to be released. Dory befriends an octopus, Hank, who wants to take her spot on the truck to Cleveland and agrees to help her find her parents in exchange for her tag, while outside Marlin and Nemo struggle to come up with a way to get inside and save their friend. Dory and Hank make their way further into the Institute’s exhibits, relying on Dory’s spotty memory and a little help from some new, but maybe familiar, friends along the way. There’s Destiny, a near-sighted whale shark, and Bailey, a beluga whale whose echolocation doesn’t work, not to mention Marlin and Nemo’s new friends which include a pair of territorial sea lions and a most peculiar loon. As they all search the Institute, Dory for her parents and Marlin and Nemo for Dory, they all start to come to a better understanding of the little blue fish at the heart of this story, not only where she came from and why she is the way she is, but the burdens she carries and the ways in which she is truly special, and what it truly means to be a family. It’s hard to realize how much the technical wizardry of animation has advanced until you compare Finding Dory to Finding Nemo. 13 years ago the visuals of Nemo were absolutely breathtaking, and the artistry and craftsmanship that went into the film still hold up today. But by comparison, Finding Dory seems infinitely more real. The development of Pixar’s visuals was on display in their previous film, The Good Dinosaur, but Finding Dory surpasses even that. The scenery on display in the film is unbelievable to behold, and at times I could have sworn we were watching a documentary rather than an animated film. But beyond simple photorealism, Dory uses cinematography, lighting, and visual design much more emotionally this time around, whether it’s showing us the wonder of a sting ray migration or the isolation of a darkened kelp forest, every visual helps to enhance the story. The characters look even more tangible than before, but are also more expressive and more connected to the voice performances. And the sea otters are just adorable. Finding Dory is a visual marvel, but it’s also so much more. Riding on the backs of both an excellent voice cast and a stellar script from director Andrew Stanton (who worked with co-director Angus MacLane, Victoria Strouse, and Bob Peterson, Dory is frequently hilarious. Albert Brooks takes a bit of a back seat this time around as Marlin (along with newcomer Hayden Rolence as Nemo), but this allows the new characters to shine. At the forefront is Ed O’Neill as Hank, the 7-armed octopus, whose grumpy impatience with Dory’s memory issues hides something a bit softer underneath. Hank, like some octopi, is able to camouflage himself and blend into his environment, an opportunity for some hilarious sight gags throughout the film. (He also gets the film’s best line.) Kaitlin Olson is sweetly endearing as Destiny, while Ty Burrell is neurotic and insecure as Bailey. Diane Keaton and Eugene Levy are charming as Dory’s parents in flashbacks, while Idris Elba and Dominic West get some funny moments as a pair of sea lions. And Sigourney Weaver. Oh my god, Sigourney Weaver. Just you wait until you see. But there’s no question that Dory is the star of the show. Ellen Degeneres turned in what is, for my money, the greatest animated voice performance of all time in Finding Nemo, but she manages to surpass even that this time around. Dory is still hilarious, but Degeneres really brings out Dory’s fear and insecurity, and her anger with herself over her condition. She hasn’t lost the unwavering determination and optimism that made her such a joyful character, she’s just more rounded and real now. But as brilliant as Degeneres is, she’s undoubtedly helped by the brilliant script, which has redefined Dory’s short-term memory loss as a mental illness rather than just a funny quirk, something that becomes shockingly clear in hindsight. Finding Dory will be instantly relatable to anyone who has, or has a family member who has, struggled at times against their own brain, whether as an illness or a learning disability. We get to watch as Dory’s parents do their best to build her up and to show her how loved she is as a child, even as we watch her come to grips with the fact that she’s not the same as everyone else. We see her coping strategies, some of which tie in to moments from the first film and give them new meaning, and we despair with her when she feels she’s let someone down. It’s heartbreaking to hear her apologize for her condition over and over again to the people she meets, with “I’m sorry” always hanging on her lips just in case she screws up again. We see the very real frustration that goes along with her illness, both from Dory herself and from those who love her, who in heated moments might say something they regret that haunts them later once they realize what they’ve done. But we also see her irrepressible spirit and the way she inspires those around her, not by in some way overcoming or beating her condition but simply by being true to who she is. In a way, Finding Dory is almost a companion piece to Inside Out, a film that not only helps us understand ourselves but understand those around us. Without spoiling anything, it’s fitting that Finding Dory ends with something of a contented sigh, in a way that feels far more real than the sort of finales we’re used to. Rather than attempt to solve all of the characters’ problems, Andrew Stanton and company are content to merely allow them to grow naturally, whether that means growing in empathy, in confidence, in self-acceptance, or in a deeper understanding of family. Finding Dory may be full of laughs, exciting action, and beautiful scenery, but ironically for a movie about a bunch of fish it’s in the human moments when it really shines. And the fact that those moments of humanity are often complicated, messy, or even tragic just makes the film that much more relatable. Unlike with The Incredibles, I never found myself clamoring for a sequel to Finding Nemo. While I wasn’t opposed to the idea, and was even delighted at the prospect of more Ellen Degeneres, I never felt that Nemo needed a sequel, that it was perfectly self-contained, especially after 13 years. But how wrong I was! Finding Nemo may be the most important animated film with regards to the history of the medium, but Finding Dory is a film that is superior is almost every way, that is made richer and deeper by avoiding the perfection that came before. Dory may repeat herself again and again, but I can’t wait to see Finding Dory again and again, because it’s a film that’s just unforgettable. Note: Playing in front of Finding Dory is the Pixar short Piper, which is the cutest thing I’ve ever seen, and is both heartwarming and visually stunning. So make sure you get there plenty early because you don’t want to miss it. This entry was posted in Movie Reviews and tagged Disney, dory, Ellen Degeneres, Finding Dory, Finding Nemo, Movie Reviews, piper, Pixar by lovepirate77. Bookmark the permalink. I agree that “Finding Dory” had a LOT to live up to and for me, it failed miserably. Enjoyed reading your review! Thanks for reading! I’m sorry you didn’t like Finding Dory, but it’s good to hear different opinions. Thanks for taking the time to read and comment! Agreed! Always a pleasure to see what other online critics thought about films. Can’t wait to read more of your reviews. I never really noticed that Finding Nemo was an important film in how the public saw animated films. Granted I was 12 when it came out and not into studying movies and their effects yet, so I’ll take your word for it. I’m still quite scared that this film will disappoint me, but your positive reviews have given me some hope. You make me feel so old! As for Dory, I could definitely see people not being a fan, but me and my coworker who saw it last night (both of us huge Pixar fans) thought it was even better than Nemo. I hope you like it! I definitely don’t think there’s anything to fear even if it doesn’t quite live up, but that’s just me. your review very short, sweet and to the point, excellent! I cannot wait to see Finding Dory. A friend is taking me this afternoon, and despite the drugs blurring my eyeballs, I will be front and center immersed in this fabulous dive into great storytelling. I loved it until they stole the truck and then it was over for me. I was suddenly having flashbacks to The Secret Life of Pets. Ahh, I haven’t seen Secret Life of Pets. But Finding Dory came out first, so Pets should have been giving you flashbacks to Dory! That’s fair, however they also did the same thing in Over the Hedge and that was ten years ago. Have a look at my full review but do you ever watch a film and you’re thinking ‘oh no, don’t go there – you are heading straight into a big pit of sticky cliche’ and then they do? I felt the same when I saw the song and dance number coming at the end of Zootropolis (topia). Finding Dory was wonderful in places but I couldn’t get past the octopus driving the truck. I mean, as if that would happen in real life! If he had all his legs maybe! But then, it’s a CARTOON. And the point of the cartoon format is to take us out of the muggle world and into another space where anything can happen. The point being is the story internally consistent. Pixar is able to create wonderfully detailed, realistic worlds, like the sea and marine center of Finding Dory, while still being a cartoon with all its capabilities for exaggeration and invention. Somehow they never quite fall into the Uncanny Valley. I personally loved Hank and his exploits… even the truck driving bit. I think it made it a bit more of a stretch when there are humans in the same scene, then we tend to want it to be more like our own world, rather than the world of talking fish…we’ll accept talking fish when they are underwater with no humans, but when the talking fish drive trucks on our highways it gets weird.